"One of the staff members asked if I wanted to work on the newsletter and it peaked my curiosity; I wanted to see if it would be the right place for me. Because of the side by side philosophy within the Clubhouse model, I was able to address my fears associated with the computer. I’ve taken a leadership role with the newsletter and now help other members who have the same fear I did when I started." 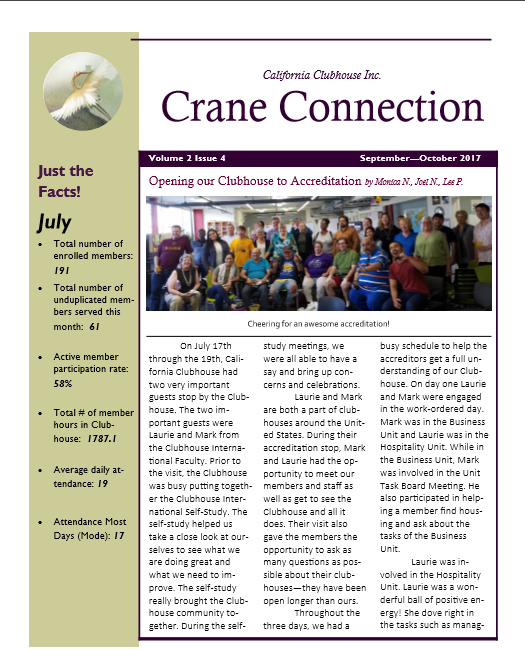 Crane Connection is the California Clubhouse monthly and bi-monthly newsletter completely produced and distributed by the members and staff in the Media and Marketing department. Download one of our previous Crane Connection editions below. Please browse our archive of previous newsletters and read what our Clubhouse team is up to! 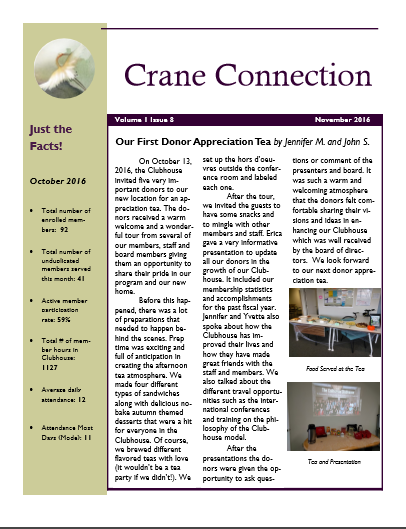 You can access a newsletter by clicking on the image or by clicking on the Issue. Once we arrived at The Meeting Place Clubhouse, the receptionist welcomed us and asked us to sign in. After that, we were led to the work units and I was amazed at how many members had shown up in the early morning! There were between 25 to 30 members when we arrived. It was a memorable walk and a good time was had by all. I like when the Clubhouse goes on hikes and I hope to go on more of them in the future. I hope we can go to some new locations. I love reading to children and it helps my personal growth. My self-confidence and calmness are met. At first I felt a bit nervous, but became more comfortable with the situation. I know I’m influencing their educational success prior to beginning school. “Finding Clubhouse is the most privileged experience in my life journey towards my recovery.” -Sara L.
I found this experience very exhausting but also very rewarding. I was very proud of myself and our clubhouse. From my experience this was a great chance to learn and see a clubhouse that has been in existence for 28 years. The trainers were wonderful! It showed me what a clubhouse can be. On one hand, we encourage each member to do as much as they felt comfortable doing, to pace themselves according to their limits; some of us never know, on any given day, how energized we’ll be; and on another hand, we had a communal goal which required showing up and pitching in. Together we rose to the challenge, dividing the tasks according to our varied abilities, and our preparations resulted in a well-produced, posh event. “I am so happy to have found the California Clubhouse. Afternoons were very hard for me. I mostly watched TV and missed human contact. Now I have somewhere to go where people are super friendly. It makes me feel good to do meaningful work and contribute to our community. I am very grateful for the Clubhouse. Coming here has helped my depression tremendously!” – J. M.
“I’ve been feeling a lot better these past few weeks since I have been coming here (California Clubhouse). I’ve been in mental health for 30 years and this is definitely an appropriate place for me to come. My doctors and case worker likes the fact that I come here and it prevents me from isolating.” – R. D. L.
I am diagnosed with Bi-polar disorder. I became severely depressed in August of 2014. I couldn't talk and lost communications with all my friends. My sister, who is a teacher, found out about the California Clubhouse from a counselor, I started going to the Clubhouse on April 27, 2015. I became a founding member and came every day it was open, I helped the Clubhouse to open their doors on May 27, 2015. Slowly I started to talk again and started to get in contact with my friends. I now have an active and healthy life.” – A.C.